If your goal is to surround yourself with several hundred outstanding undergraduate students from throughout Florida, you can’t do much better than the Florida Undergraduate Research Conference (FURC). This is certainly what Claudia Segovia-Salcedo, Deb Paul, and Gil Nelson discovered when they attended their first FURC on Saturday, February 22 hosted by Florida International University’s Honors College. Well over 500 students attended the event, a number that seems to grow each year. The main part of the event was organized around several rounds of poster sessions, with undergraduate student researchers on hand to describe their projects and explain their results and discoveries. More than 30 posters focused on the biological sciences, representing molecular biology, botany, entomology, and ecology. 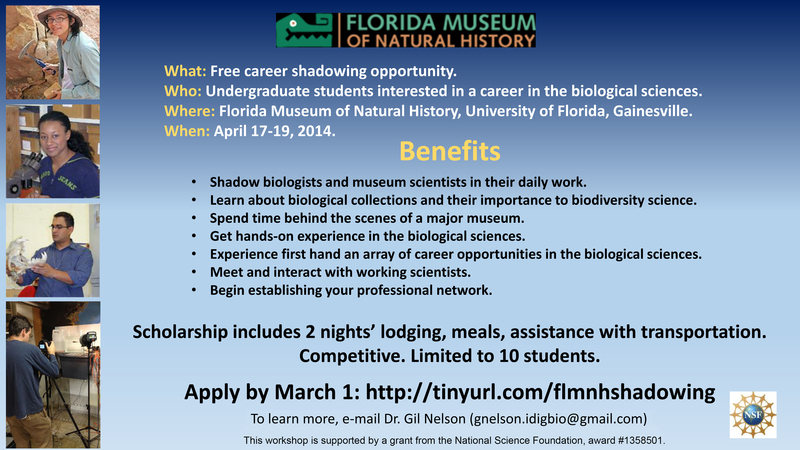 Nelson, Paul, and Segovia-Sacedo made the trip to Miami to advertise iDigBio, promote careers in the biological sciences, and recruit for the upcoming Biology Careers Shadowing Days to be held April 17-19 at the Florida Museum of Natural History (FLMNH) in Gainesville, Florida. As originally conceived, the Shadowing Days event was designed to host ten undergraduate students, offering them the opportunity to shadow and visit with collections manager, researchers, and graduate students, all focused on biodiversity research and potential careers in the biological sciences. iDigBio views this an opportunity to showcase the work of museums and collections professionals. FURC followed iDigBio’s Careers and Graduate Study in the Biological Sciences workshop held at University of Central Florida on February 1, 2014. Students at both venues were offered the opportunity to apply for the fully funded shadowing experience. Twenty-five students applied for the ten scholarships, nearly all of which submitted impressive applications. Given the quality of the applicants and the high interest, the selection team decided to increase the number of scholarships to 15, 50% more than originally envisioned. Depending on the success of this year’s shadowing days, iDigBio hopes to repeat the opportunity in 2015.